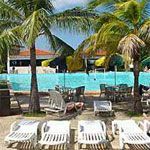 When you arrive at Breezes Varadero, previously Club Varadero, a lush tropical setting surrounds you. Built in 1992, it is the first Super-Inclusive® resort in Cuba, designed for couples and adults 16 years and older. It covers 26 acres of land, with several blocks of rooms offering paradisiacal privacy, further enhanced by lavish tropical vegetation, in which trees alternate with exotic flowers. No reviews for Hotel Breezes Varadero yet.